I am ever so hopeful that the Spring has sprung! Claire here to host this weeks challenge. I am sure that some of you managed to see Nikky at Harrogate, but if not there will be chance to see her on Create and Craft tomorrow (Saturday 26th at 12.00p.m.) for a brand new dedicated rubber stamping show - the Polkadoodles shop has LOADS of brand new products in this week (including a sneaky opportunity to buy a brand new CD long long before it hits Create and Craft) and Nikky will be launching the brand new Wonderland series on the show so make sure you tune in! Also, check out this!...news of the first Craft Roadshow dates at Milton Keynes in June - 3 full 4 hour classes, loads of extra crafting, shop till you drop, extra demo's and make & takes and some surprise guest appearances too - you will LOVE it! You can book here, please don't miss out on this great crafty 2 day event, you will have such a good time! Please e-mail Nikky with your placing and 'Challenge 10 top three' in the subject field. I just love Nikky's new Alice in Wonderland stamps, and already the wonderful hare is amongst my favourite all time images. So with that in mind my challenge"The Spring has sprung" seemed all the more pertinent! It's our stashbox stamps challenge this week and for the design team its a great opportunity to show how versatile Polkadoodles' products are alongside any other rubber stamp company images! I hope you enjoy the great projects from the team and we look forward to visiting your creations. Good luck with the challenge - the closing date is Sunday 3rd April at 12noon GMT. 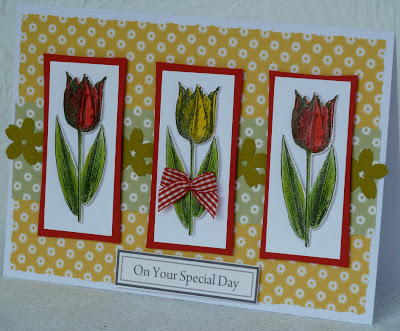 Audrey: For this card I used spring colors. I love the paper on the CD Paper Boutique III. 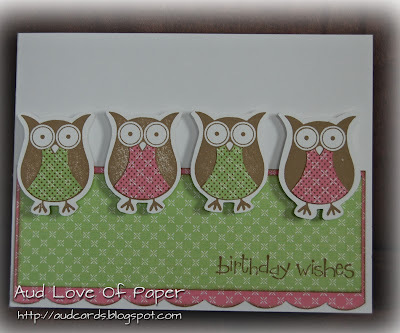 I used some of my Stampin Up stamps and paper pieced the owls bellies. I used 3D dots to give the owls some dimension. D'Anne - I dedicate this card to all my on-line crafting 'Best Fishes.' This card was created with Polkadoodles Tweet digital paper from the Paper Boutique Volume 1 cd and Stampin Up Best Fishes stamp set. The stamped images were colored with Promarkers, added Doodle Dewdrops and some ribbon for the finishing touches. Emma Hiya, here is my card for the week, it is an oversized tag. I have used one of my favourite stamps as per the challenge, coloured her with Promarkers and teamed her up with some beautiful backing papers, flowers and butterflies from Sundae of Seasons CD. The faux brads are Card Candy available in the Polkadoodles web shop too. 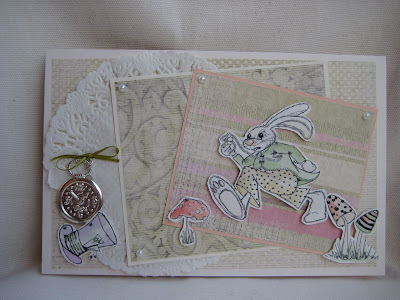 Saskia - I used a cute stamp from the Laurence Collection to make my Spring card! All the papers and the sentiment are from the Sundae Of Seasons cd-rom. Josie - How else would you like to spend the Spring? How about on Polkadoodle Street! I used these gorgeous Rubber Stamps and stamped them on to their own street. Then coloured them all in with Pro Markers. Lis-m: This week I have used a Lili of the valley stamp for my spring image. The papers are from Paper boutique Vol 1., from the funky flower section. I have 3d'd some of the flowers as well as the fairies. Tied a little string across to hang my tags for the wish message. Miria - For my card I used a Lily Of The Valley stamp coloured with waterpencils and Distress Inks, the papers and sentiment are from Polka Doodles cds, for the background I used the new released Alice papers. Buttons and ribbon from stash. Fliss - For my card this week I've used a favourite Spring flower by Hero Arts in the colours I have in my garden although there aren't any tulips out yet. 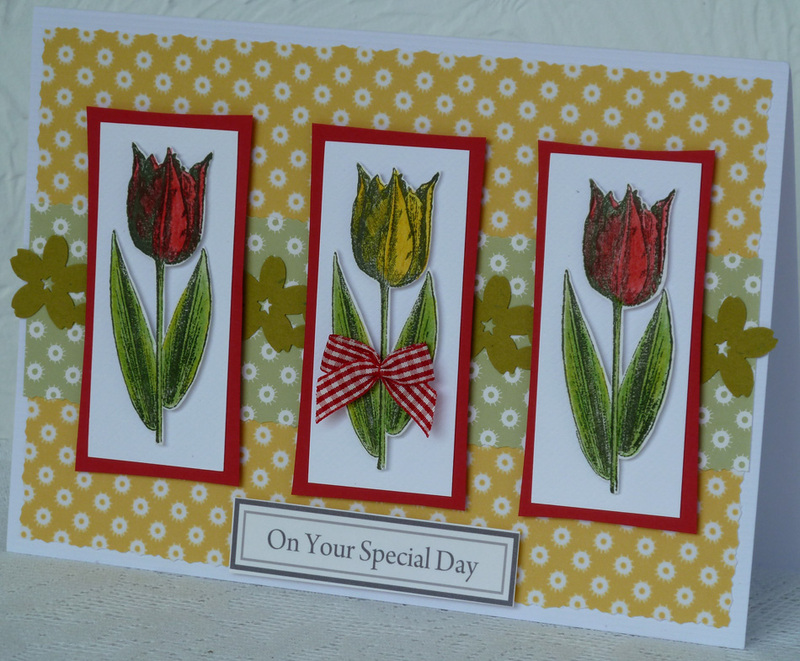 The tulips were stamped with green ink, coloured with pencils and cut out. I added them to some white textured card mats with a further handcut mat of red for some pizazz. I've used some gorgeous Spring colour backing papers from the Sundae of Seasons CD, a greeting from the Candy Doodles CD and added a bow from my stash and a punched border. Colette - This week I have used the Ursula template set from the Get in shape section of the Back to Nature CD rom, I have replaced Ursula the cow, with a Magnolia stamp coloured with Promarkers. I have layered up all the flowers, and added a few extras to the fence. The dragonfly is from the Sundae of Seasons CD, it has been printed onto pergamano paper, cut around layered and glittered. Ruth: I've used a digital image from The Clip Art Fairy this week and teamed it with papers from Sundae of Seasons. The image has been coloured with Promarkers. 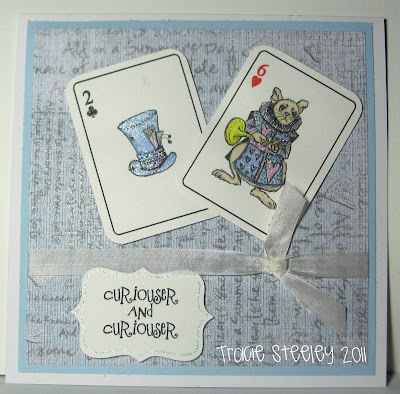 Lou: I have used a cute Tilda image for this weeks challenge teamed up with a selection of papers from the Back to Nature CD. I do so love the bunting paper from the "Picnic" section and had to use it on my card. I have then made further bunting using other papers from the same CD, decorated with Card Candy (available from Polka Doodles too). The butterflies are from a Stamps Away set and the sentiment is from SU. The large scallop edging was made using a circle punch. Good luck with the challenge this week! Don't forget our rules and you have until Sunday 3 April at 12noon GMT to enter! Hello Doodlers! This is Nikky and I'm just hijacking this week's post to let you know all the latest news and goss! You can see us at the Harrogate GNPE event this weekend, Saturday and Sunday where we will be demoing lots of new stash and goodies for you, so if you're there come and say hi! Talking of new stash...the Design Team girls have all been squealing about our latest stamp set (and a co-ordinating CD which holds 100 papers no less) which will be on sale for the first time at Harrogate - watch out on the website for it next week, and you can catch some glimpses and sneaky peeks below, I don't think they could resist showing their fabulous creations any longer. Hi Everyone, its Tracie here, and its my turn to set the challenge this week. Before we get onto this week's fabulous creations from the design team here are the top three from the week 9 challenge, three handmade flowers! Congratulations! Please email Nikky with your placing and 'Challenge 9 top three' in the subject field. Good luck with the challenge - the closing date is Sunday 27th March at 12noon GMT. D'Anne - I’m still loving the springtime feeling which made me want to make a bright and cheerful flip album. This album can capture your Spring photos of your family and friends. My album was created using the Floral Frenzy digital paper and flowers from the All Around & Everywhere cd. Fliss: My collage style card features a rather sheepish looking bunny Knave of Hearts using the totally gorgeous new Alice set of stamps and some of the matching set of fabulous papers. 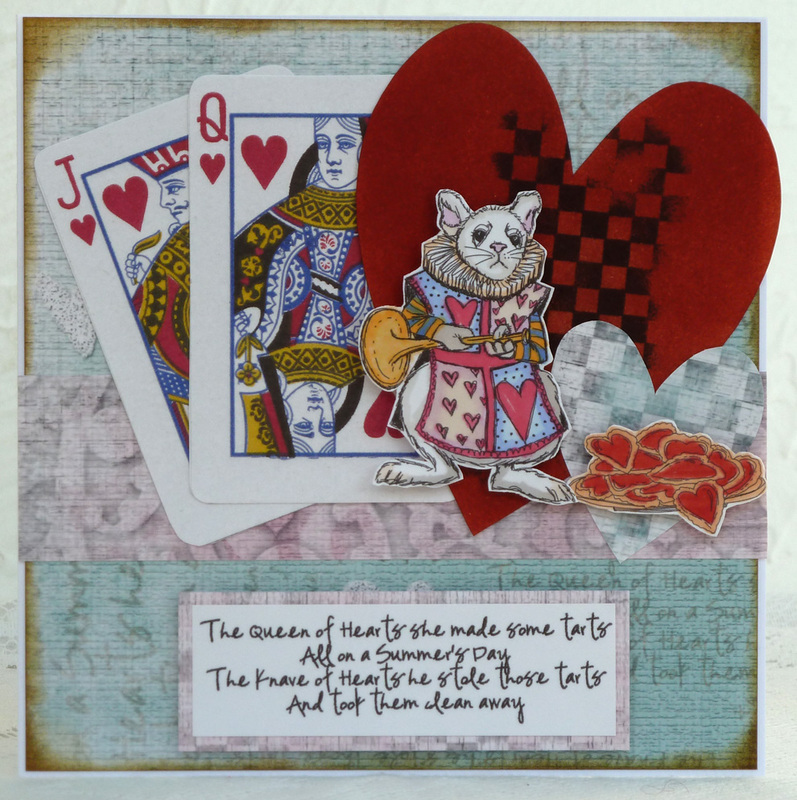 All images were coloured with Promarkers and the heart shape which I cut from a home made template was sponged with Distress ink after stamping the checkered design. Some playing cards add to the look. Audrey: For this project I decided to make a corner bookmark since I haven't had time to read a book since I had my son. I used All Around And Everywhere for the digital papers, used some ink for the edges and Enamel Accents for the white dots to give it some dimension. Claire: My chosen book is Alice in Wonderland and I am guessing all will become clear why soon! Curiously my card had the peach as the card base and I stuck my image on upside down - so had to redo with the bright blue card base - oh so much better, spooky! 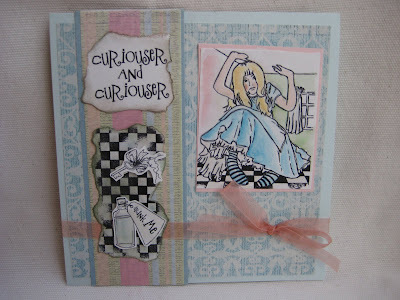 Saskia - Wow, wow... the new stamp set Alice In Wonderland is amazing! So... look out for this new design! Dee: Like most of the Design Team I have gone for Alice in Wonderland too (what a surprise, lol). I've made some tags, but I just couldn't choose which one to use so I'm going to use them all. I think the flying hats may be my favourite. I had great fun making these getting really messy in the process, but it was all worth it. These new stamps (available tomorrow at the show mentioned above) are just excellent to use. 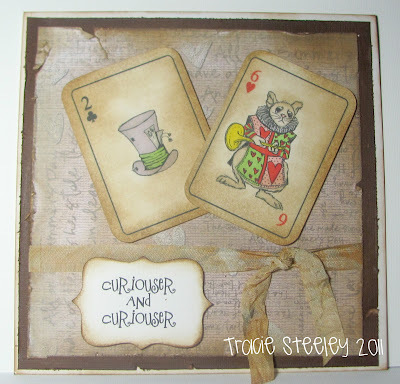 I used inks which I spritzed onto the cards, and Tim Holtz Distress inkpads which I also used to colour in with. I also used some Fantasy Film and Fibre on one of them. Lis-m : I have gone with a classic theme of Faerie Tales. I have created a box, which looks like a book. I will show you more on my blog. 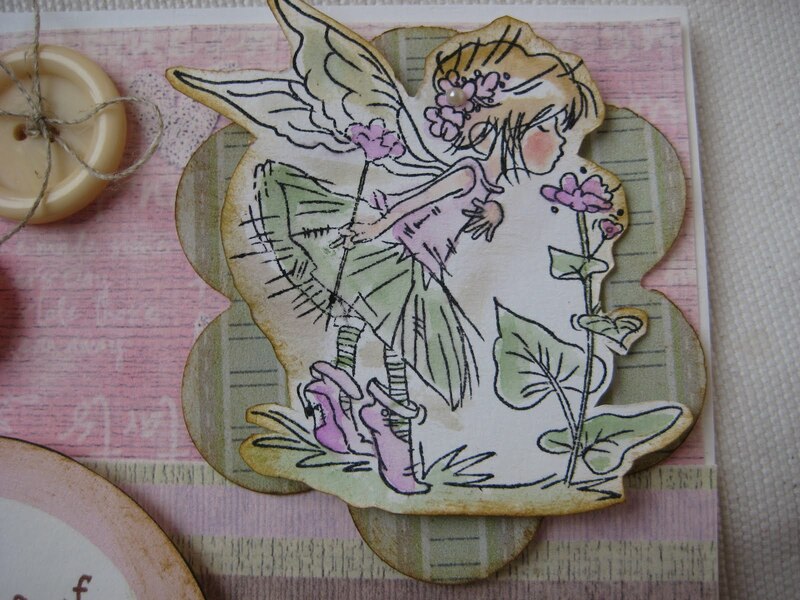 I have used "All around and Everywhere" for my papers, the mushroom house is from "Magic Neighbours" rubber stamps, and the Flutterfly Fairy is sweet Gracie. Miria - Two cards about a book - I think you can guess its title lol! The images and the papers are of course from Nikky's new gorgeous Alice's set and cd, coloured with waterpencils and Distress Inks. I added some embellies from stash. Josie : For this weeks challenge about books, I had to mention the books that my big brother passed on to me. They are old, they are tatty and I love them. So here is my scrapbook page on my Snoopy Books! I used two different backing papers from the All Around and Everywhere Cd Rom. I went with the lovely brown theme in the papers, so had to use the Fru Fru Ribbons too! I used the lovely Sensational Sentiments Stamps as it sums up how I feel reading these books, even to this day! Ruth: I too have gone with Alice In Wonderland as my book theme and have used the wonderful new stamps to be launched this weekend at Harrogate. I've used the plate of hearts (with glossy accents) and the sentiment. 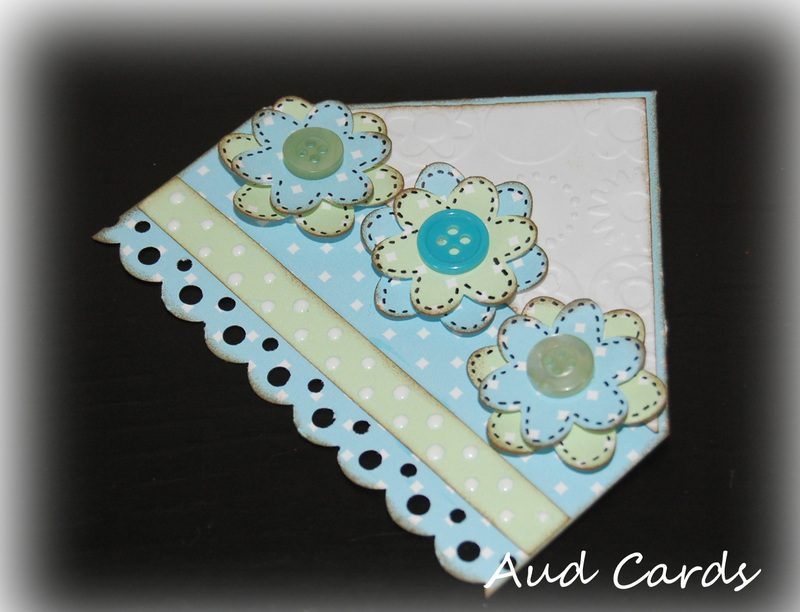 The backing paper is from the same set and the ribbon and card blank are from my stash. Watch out for more of these stamps over the next few weeks! Emma well I made a few things with the wonderful new stamps from Polkadoodles being released tomorrow - I absolutely love these stamps, they are so up my street, here is just one of the cards I made. I masked the stamps to build a scene then coloured with Promarkers in Ice Grey 1 to 5. Colette: I have used an old hard back book picked up cheaply in a charity shop, stuck the pages together and cut out the middle to make a box, I then decorated it to look like... a book?!!!!!! I've used a black and white stampie from the Spring section of the Sundae of Seasons CD rom removed the glasses added an eye patch and coloured it in photoshop, also using red polka dot paper from the same CD to piece together a bandanna. I paper pieced the stripe top, jeans and boots from the Not for Girls CD. The skull and cross bones were taken from the Candy Doodles CD. I was really pleased with myself until my grandson told me that the pirate needed a sword, so I had to rack my brains and ended up using a tree stampie (upside down) and two Christmas baubles from Sundae of Seasons winter section to make the sword, which I then coloured in photoshop. I covered the book with paper from the Paper Boutique Vol III CD and used a sizzix die to cut out the label shape, using another paper from PBV-III. I printed a burgundy colour onto some leather finish card to make the spine, corners and fastener and used a piece of jute tape behind the pirate to add a bit of texture. Some magnetic tape holds the box closed. Lou: I have also gone for "Alice in Wonderland" for my book inspiration this week and have made a book mark tag. 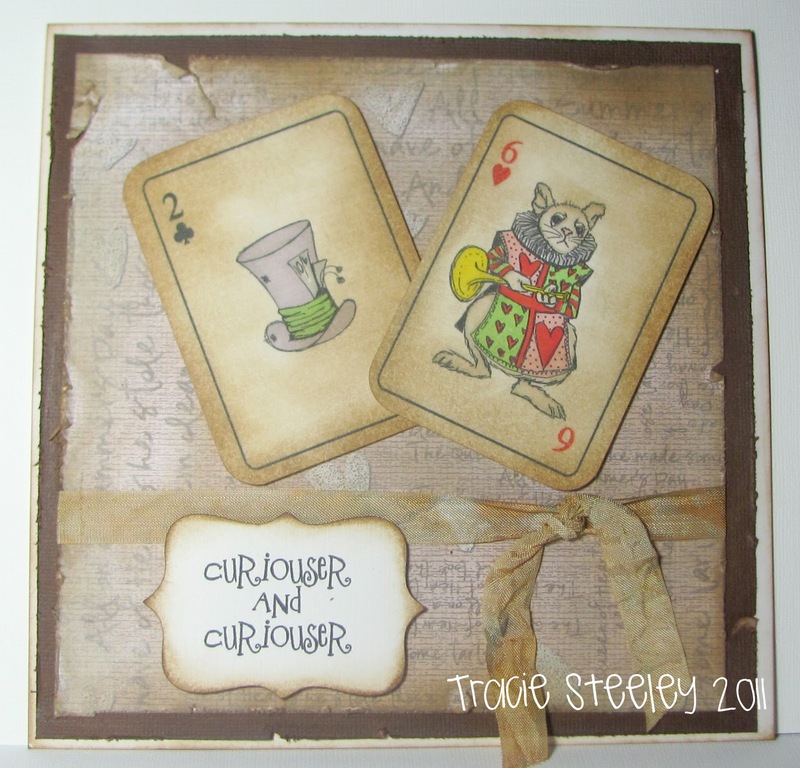 I have used several images from the new stamp set which is being released tomorrow to create different layers. The ribbon holds the sentiment which hovers over the cute rabbit image which rests on some playing cards. 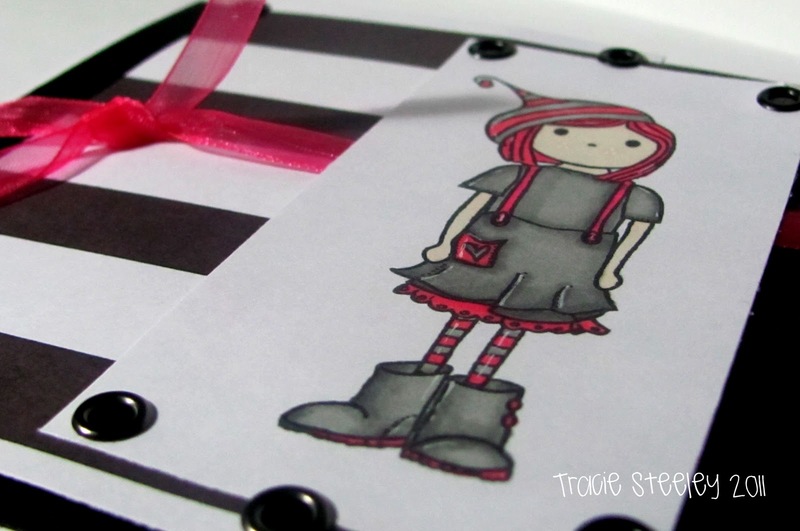 I have further embellished my tag with the top hat, plate of yummy tarts and the key. All the images have been coloured with Promarkers. I have also inked and chalked the edges to age the look of my tag. Good luck with the challenge! Entries can be added to the link below up to 12noon GMT on Sunday 27 March. Please also remember our rules! 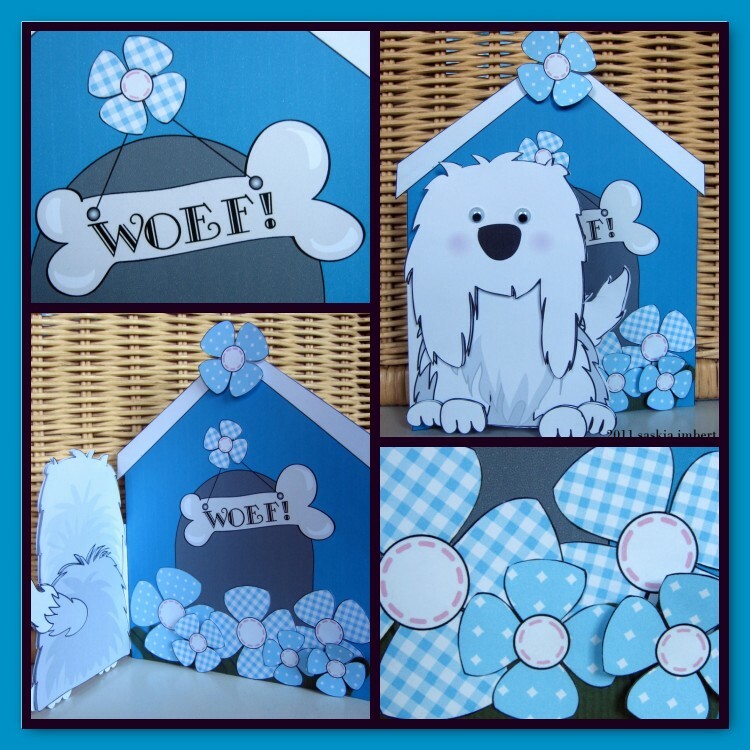 Before we get onto this week's fabulous creations from the design team here are the top three from the week 8 challenge, Stashbox Stamps, with 2 ribbons and a charm! Congratulations! Please email Nikky with your placing and 'Challenge 8 top three' in the subject field. Good luck with the challenge - the closing date is Sunday 20th March at 12noon GMT. Onto the Design Team cards! D'Anne - For this card I stepped a little outside my comfort zone. 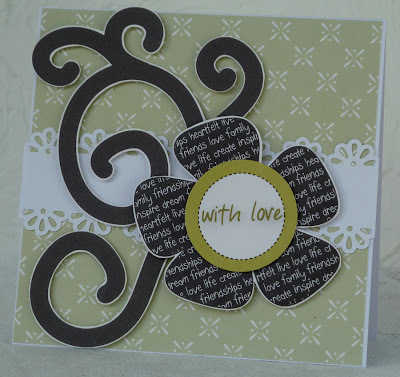 This card was created with black, white and various shades of cream. The digital paper is from the 'Shabby Estate' collection from the Polka Doodles All Around and Everywhere cd. This cd is perfect for your craft project, scrapbooking, invitation, web design, paper product, design card and everything else. Tracie: My card uses the lovely BevvieBoo fairy and the hot pink and cool grey promarkers (look she has the same colour hair as me!!) I printed the stripy paper from love and cherish and the ribbon was coloured with promarkers too. Fliss - I've made a simple card using black and white with green and all the elements come from the Sugar Birdies Collectors Edition CD. I've been itching to use those gorgeous, striking flourishes so this was the perfect opportunity. Emma Hello there, I have used black white and pink. 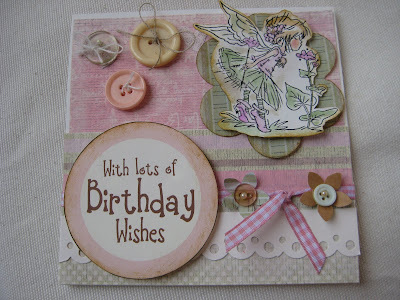 All the elements are from All Around and Everywhere CD but the sentiment is from the Fairy Flutterfly range of stamps. Lis-m: This week I have chosen black, white and red. 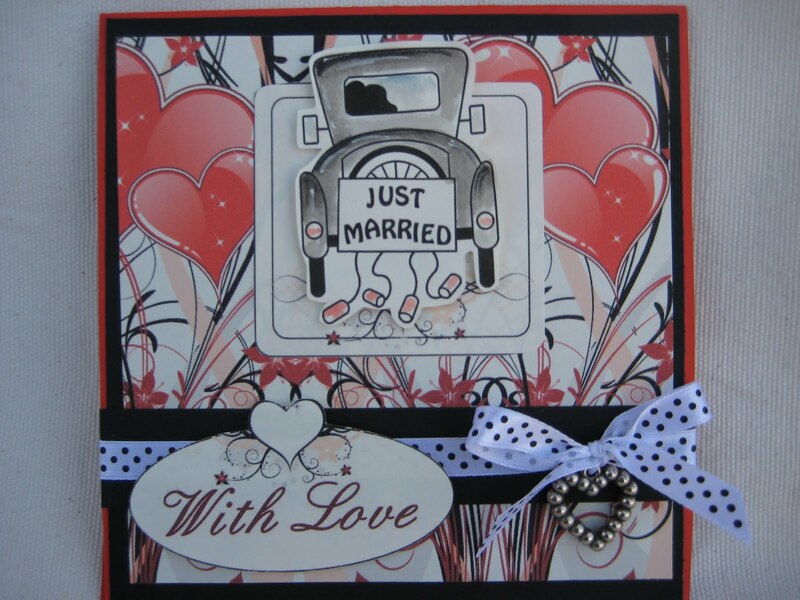 I have used the Love and cherish cd (the boundless love section) and the floral birdcage stamp. I just matted and layered, coloured my stamped image, and added a little glitter pen, a ribbon and button to finish, and the sentiment from the sensational sentiments. Audrey... For this project I used Paper Boutiques Vol. 3 for the calendar template, All Around And Everywhere for the letters, numbers and colored stampies and I used Sundae Of Seasons for the digital paper. 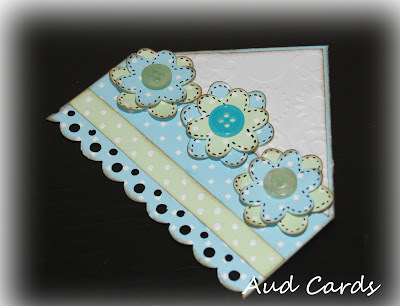 Claire: I decided to have a play with the newest cd Paper boutique Vol 3. I have been really looking forward to creating something with Betsy/Buster - the super cute dogs. I have used the stampies and added dimension by attaching Betsy's head on a spring. Saskia - isn't this dog adorable!? The template, papers, flowers... everything can be found on the All Around And Everywhere cd-rom. I added the letters 'woef !' and the wobbling eyes. So much fun making this card! Miria - My project for this week is a wedding card. The papers and the image are from Love & Cherish, I coloured the car with waterpencils and cut it out, the ribbon and charm are from stash. 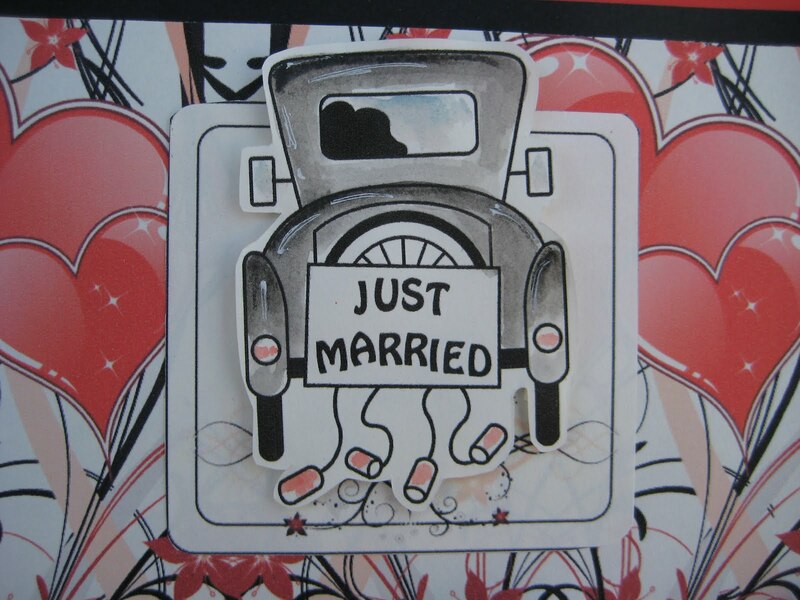 Colette - I decided to make an anniversary card, also using images from the Love and Cherish CD, I coloured the couple with Promarkers, cut around the frame design, glued it to red card and cut around again then attached to card using foam pads. I added a big bow made from ribbon that came wrapped around Primark pyjamas, and rhinestones from stash, in the centre of the black flowers. Ruth: I made this card for a work colleague who has got a little doggie just like this one! Although I think hers is without a scarf and bow! It's from Paper Boutique Vol 3 and I printed off the pre-coloured A5 size, cut out all the elements and layered them up with foam pads. You'll have to take my word for it, that I've also decorated the reverse! Added some wobbly eyes and applied glossy accents to the nose for a realistic look! Dee: I've used papers from the Love and Cherish CD this week. I cut strips of papers and wove them behind a circle aperture. I did a spot of doodling on the bird and added a big not to be missed bow. Lou: I have also made an Anniversary card and obviously turned to the Love and Cherish CD (Boundless Love section) for all the paper/card elements. The large topper is one where you can type your own sentiment into and after much faffing on my behalf . . . just settled on "Happy Anniversary". Not original but suited the purpose . . hee, hee, hee! Finished off with some ribbon, Prima flowers, swirls, punched hearts and a random pin! Josie: I love black and white with a splash of red. 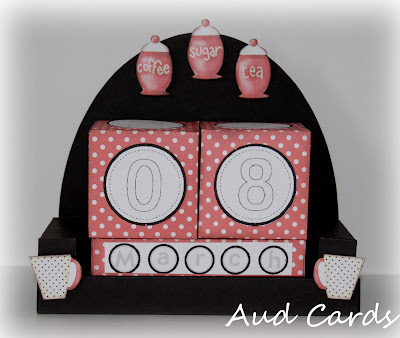 And any excuse to use these little ladybirds! 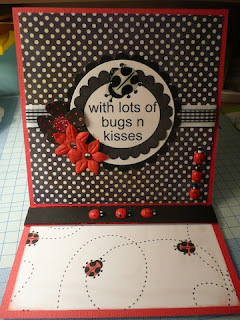 I used the topper, the dotty flower and ladybird backing paper and from the Sugar Birdie's CD Rom. I of course added some dotty paper and some ribbon. Good luck! Don't forget our 'rules' and you have until Sunday 20 March at 12noon GMT to enter your project via the link below.